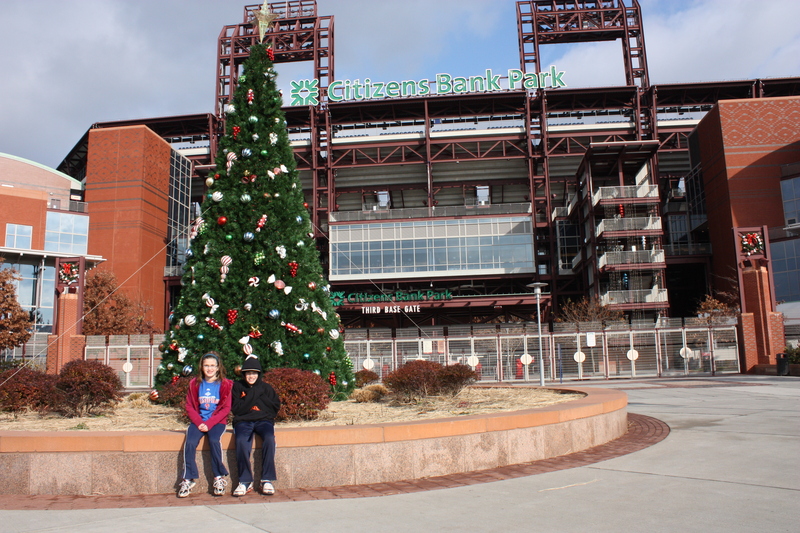 This past weekend, the Phillies held their annual Holiday Sale at the Majestic Clubhouse Store at Citizens Bank Park. Saturday featured appearances by Chris Wheeler, Milt Thompson, and Dickie Noles, as well as a tree lighting ceremony. 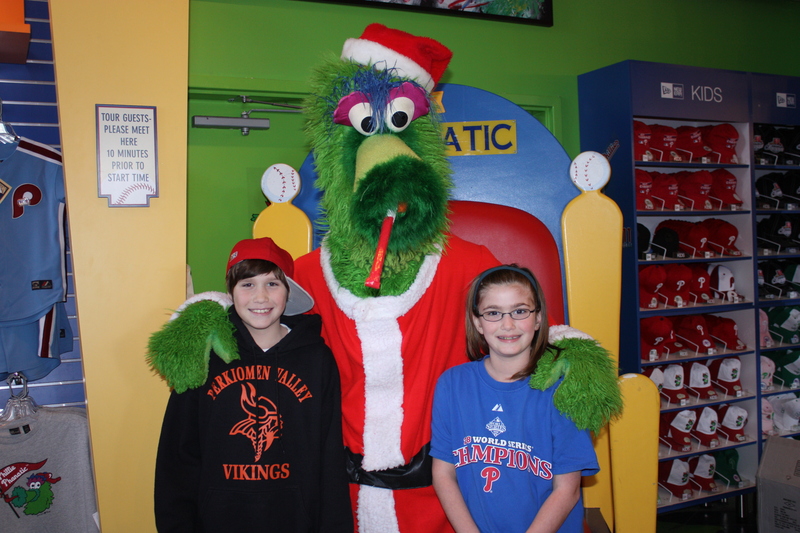 Both days featured photos with Phanta Claus, and a memorabilia sale to benefit Phillies Charities. We decided to go on Sunday, figuring it would be less crowded. First order of business was getting a picture of the kids with Phanta. I was hoping that my daughter would be willing to then forego the trip to the mall to see Santa, since (in my opinion) Phanta is much better. But no such luck, as soon as we were done she asked if she could still go see Santa. Aargh – I hate the mall this time of year! Next, we browsed a room of various collectibles, DVDs, and publications. I bought a Phanta figurine, rationalizing the purchase with the fact that it was a Christmas decoration. The kids both wanted Phanatic bobbleheads, which I agreed to with the understanding that they were part of their Christmas presents (note to self – must remember to get bobbleheads wrapped, and out from under my bed). 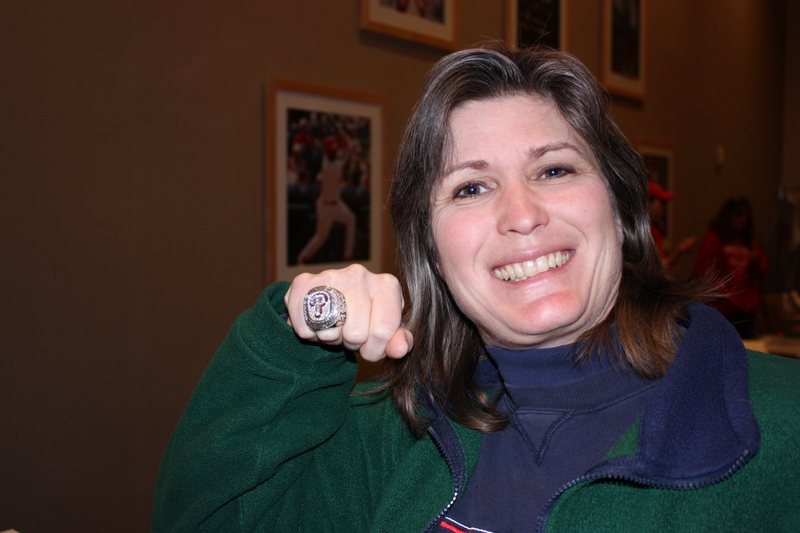 One of the Phillies employees manning the bobbleheads was wearing his World Series ring, which he kindly allowed me to get a closer look at, and even try on. In my excitement at actually putting it on, I never looked to see which way it was facing. Thankfully, as you can see, it was right-side up. Also thankfully, it was really big, so there was no danger of getting it stuck on my finger. Now that would have created a problem! 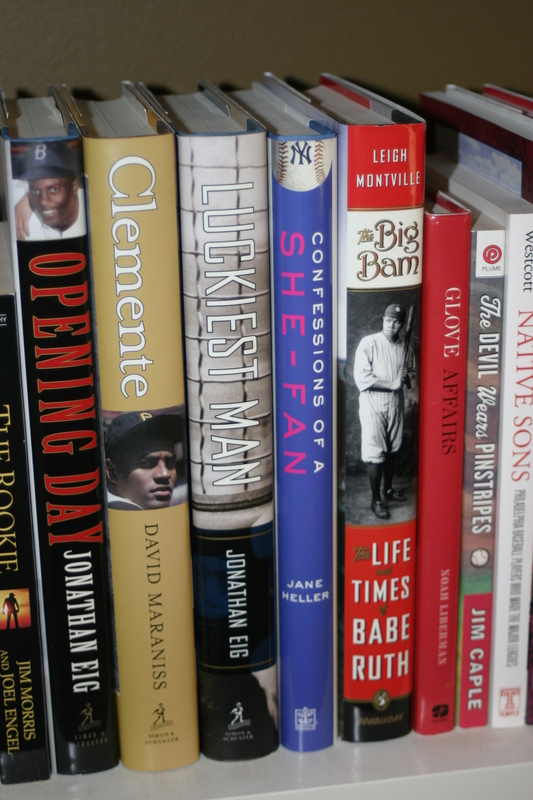 There were more items for sale (autographed balls, bats, game-used stuff) in the Hall of Fame Club, which normal peons like me never get into. So it was worth looking just for the chance to step inside. Also, they were handing out free chocolate-chip cookies – yum! The prices, surprisingly, were not outrageous. Some items had even been marked down! I treated myself to a champagne bottle from the NL East clinching celebration (empty, of course, and unfortunately not one of the marked down items). Hey, maybe there is some Phillie DNA on it – still daydreaming about that cloning plan. On the way out, we paused for another photo op in front of the Christmas tree, which was currently unlit even though it had blazed into life the night before. Not a big splash, but more of a tiny ripple – the Phillies have finished filling out their bench by signing Ross Gload, previously with the Marlins, to a two-year contract. The left-handed batting Gload hit .318 as a pinch-hitter in 2009. Welcome Ross, good luck as a Phillie!